Giant voices and a synopsis of the Street Works Tour. 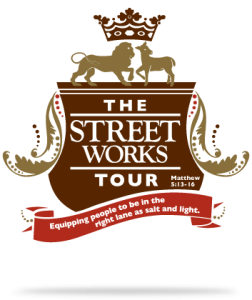 The Street Works Tour launched two weeks ago in Wichita, Kan. Designed as a day tour for the servant leader, we welcomed a mix of individuals, business owners and leadership from not-for-profit organizations, churches and helping ministries. At a high level the day was designed to work participants through the four tenets of our Creel ModelSM—vision, specification, equipping and accountability—with particular focus on branding and next-step planning processes. 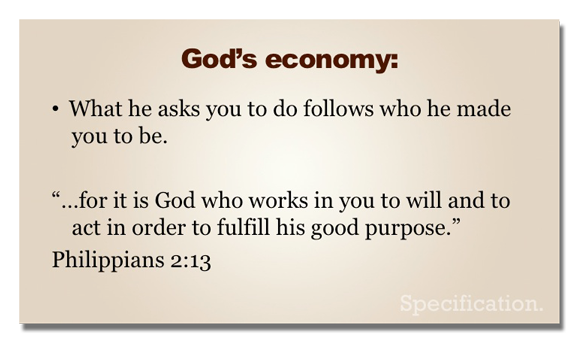 Our goal was to equip participants to discover how God has designed and called them to be at work in his purposes. We live in a branded world. The cultural war is being fought today on brand soil. Our 21st-century brand giants are powerful and compelling and seductive and they’re shutting out God. It’s time for believers and believing organizations to live and work as Kingdom giants—people who understand what it means to be salt and light (sticky) and who take God at his word when he says he has a purpose for us. The tour is designed to be an intimate interaction with the audience. 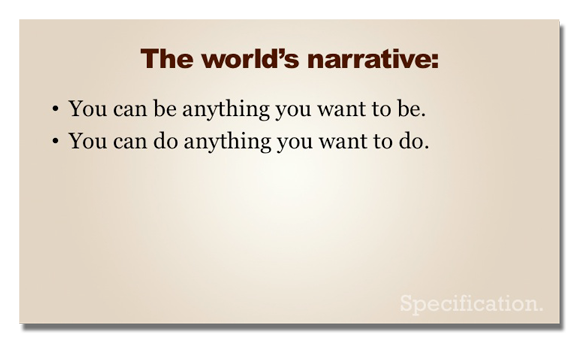 Storytelling from our book Minding the Gap promotes transparency. But the real/rawer underpinning of the day comes from the video Kingdom giant talks. (See links below to short excerpts.) These giants model for us. They point to what it means to live abandoned to God’s purposes, to be willing to pay the high cost of participating in them. You will enjoy, as I believe participants at the launch tour did, their unique personal perspectives. Pete is an entrepreneur and owner/managing director of a company called Capital III that creates economic, social and spiritual capital through investments in private companies. Pete shares his views about a single, God-inspired lane where the lines of business and ministry blur to create a single lane that is focused on significance and achieving excellence. Brent left an executive management position for a large banking organization because God pressed on his heart in a new way. Brent’s story is about surrendering to God’s reigning purposes, to his best for Brent’s life. His Kingdom talk comes with a caution: we aren’t all called to vocational ministry. Calling isn’t about 9-5 or a certain job title. We believe calling is a personal invitation from God to participate in his purposes—for a season or a decade or a lifetime—in a way that is uniquely tied to how he made us. God specifies our identity on this earth. He gives us the brand DNA—the unique voice, gifts and disposition—to count in specific ways in specific places for specific people. Dr. McKay captures the vital importance of living and walking in full expression of how God has designed us. We asked Dr. Davis to give a Kingdom talk because his life and work are active on all points of the Creel Model. God has given him a vision to penetrate the urban world with truth. There is comprehensive specification for that vision, strong equipping and an iron accountability to do and finish the work with excellence. Work in God’s purposes is often uphill and bruising. Very often, it’s after hours when we’re tired and it’s inconvenient. Dr. Davis gets to the central idea that we’re accountable to one. And that can be excruciatingly difficult, enormously costly, wearying and, frankly, disappointing and lonely. Quick tour highlight: The giant talks were filmed and produced by Jill Meade, Idea Works Creative. (Visit ideaworkscreative.com if you’re looking for help. Jill’s a gifted listener and editor. Jill and her husband Sean founded the middle-school ministry Stuck in the Middle.) Jill’s daughter Maddie, 9, accompanied her to TUMI. Maddie later innocently told me she expected to be very bored, but had, in fact, listened with interest to every word Dr. Davis said. Cindy is a giant who left a business lane in which she was very successful to follow God’s leading into new, uncomfortable territory. She’s mastered the discipline of showing up to wait and listen for direction about God’s new enterprises for her. She is a reminder that Kingdom giants are in the right place with the right people doing the right next thing at God’s right time. Jane is a warrior who understands her strength in battle for the organizations and people she loves is prayer. She recognizes a vision from God for something or someone typically represents the biggest stretch of our lives. We may be compelled by Christ, but we are insufficient for his purposes. We are productive and effective—we come alive—only when we surrender to him and the power and work of his Holy Spirit in us. David, a powerful trial attorney and gifted musician, gives us the keys to control what Oswald Chambers’ calls our spirit’s “weather.” Kingdom giants, he says, learn to turn off the noise.